If you’re coming in for a cruise from Port Canaveral, chances are you will arrive via the Orlando International Airport. The airport is 45 miles due west of the cruise terminal. Of course, if you’re not sure where your going or how best to get there, that distance may as well be an ocean. Below, we’ve rounded up all the information you need to get to the port and start enjoying your cruise. The easiest address to use for the port is 9005 Charles Rowland Drive, Port Canaveral, Florida, 32920. If coming from the Orlando airport, take the North Exit from the airport, staying to the right, to State Road 528 (also know as the Beachline Expressway) East. You will take S.R. 528 about 45 miles directly to Port Canaveral. Note that the “Beachline” is a toll road. The toll runs $2.00 for a one-way trip from the airport. If you’re driving to the port, click here for more information on parking. If you are flying in for your cruise, there are several options for getting there without a car. While many of the options are pricey, keep in mind you won’t have to pay for parking. If you want your cheapest option (and to help the local economy), then we suggest an independent shuttle service. There are numerous companies that can do the job and usually at rates below that of a taxi. Rates and service level can vary from company to company and will fluctuate. There are a number of companies in competition and some run specials from time to time. The cheapest regular rates we’ve found is $30 per person round-trip by Go Port Canaveral. For most of the other shared shuttle services, expect to pay about $40-60 per person for round-trip service. All of these shuttles run from the airport to the port. You should note that this is shared shuttle service that’s on a schedule. Orlando and Port Canaveral are meccas of tourism. Between theme parks, cruises, and beaches, there is an amazing amount to do and see. In addition, there are tons of hotels all competing with each other for your business. As a perk, many hotels offer extras such as shuttles between Port Canaveral and the Orlando airport and/or the cruise port. The good news about these services is that they are perfect if you are flying in the day before your cruise. The hotel shuttles will pick you up, take you to the hotel, and then to the port the next day. To help you find a place offering a shuttle, we have a list of hotels with Orlando airport and cruise port shuttles for Port Canaveral. A one-way trip from the Orlando airport to Port Canaveral by taxi is estimated at $115. Keep in mind that as many as five passengers can ride for the price of one. For that reason, taxis can make sense for families, but are somewhat expensive for just one or two passengers. For example, a family of four has a per person charge of about $26 one-way or $52 round-trip. One of the cheaper options of getting there is a one-way rental from Orlando to Port Canaveral. Rates for this service run about $70 per day (although will vary). So round-trip expect to pay from $120-$150. The car gives you a freedom of exploring and going where you want when you want, but you also have to drive and deal with the rental agency. The cruise lines will be happy to offer you a shuttle ride, if you’re willing to pay the high price. The official shuttles operated by the cruise lines charge about $72 per person for a round-trip transfer from Orlando to Port Canaveral. That translates to $288 for a family of four. Frankly, there are cheaper ways to get to the ship. In addition, cruise line shuttles only offer direct service to the ship and only on your cruise day. If you want to make stops before your cruise or you are flying in early, then these shuttles are not an option. Uber and Lyft have made getting rides easy. With just a few taps on your phone you can have a car waiting on you. The rideshare services do offer service to Port Canaveral from the Orlando airport and other points in the area. Expect the ride to be about $60-$70 per car (not per person), each way. While up to four people can ride in a regular Lyft or Uber, with luggage, that would mean a tight squeeze. We’d suggest a max of three in a regular car. If you need more space, look for the “XL” services offered by the companies. Want to feel like a rock star? Simply want to travel a little more comfortably? Then you may want to hire a private car or limo. There are dozens of companies that offer this sort of service, including many of the ones who operate shuttles. And if you are traveling with a larger group, the per person cost can be surprisingly affordable. If you’re looking for a private car or limo, then we suggest browsing this list of companies approved to pick you up at the Orlando airport. While most people fly into the Orlando airport for their cruise, sometimes airfare is cheaper to Miami or Fort Lauderdale. Or sometimes people simply want to explore southern Florida. If this is the case, you should realize that your options are somewhat limited in getting to Port Canaveral. There is no quick and easy shuttle that we know of. Instead, we recommend looking into one-way car rentals. This way you can drive to the port (it’s about 215 miles from Miami) and not have to worry about parking. One-way rentals can be a bit expensive for what is essentially one day of car rental. We found rates between $70 and $110. Rental rates are slightly cheaper if traveling from Port Canaveral back to Miami. 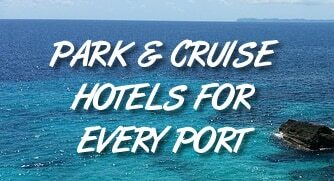 Port Canaveral Hotels with Cruise Shuttles — Staying at a hotel with a cruise shuttle can make it easy to get to the port on embarkation day. I’m planning to take my wife on a cruise to Port Canaveral next year for our anniversary. I like that there are plenty of choices to go there. I think I should opt for having a private transfer to add a bit more privacy and intimacy for our time together. Thanks for the great tips!